SEAN MICHAEL WILSON is a comic book writer from Scotland, living in Japan. 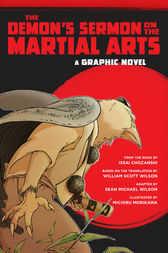 He has had many books published with a variety of US, UK, and Japanese publishers, such as The Book of Five Rings, and edited the critically acclaimed AX: alternative manga (Publishers Weekly’s “Best Books of 2010” in comics). In 2016, his book Lafcadio Hearn’s “The Faceless Ghost” and Other Macabre Tales from Japan was nominated for the prestigious Eisner Award. And in 2017, his book Secrets of the Ninja won an International Manga Award from the Japanese Government.